The composition of a painting is the way in which it organizes the flat space of the painting's surface. In analyzing composition, it can help to imagine the painting as consisting of various zones: left, right, centre, bottom, edges, and to ask whether the painting is structured according to dominant lines or shapes. In this unit we will consider various aspects of composition. In section a we shall begin by discussing the roles played by dominant lines and force lines. In section b we then go on to consider the notions of open and closed composition. In section c we then examine balance and symmetry. Finally, in section d the notions of rhythm and movement are discussed. In many paintings, a structure is provided for the painting through the use of dominant lines, which can either be made evident through real lines ie the edges of objects or figures, or through force lines: lines which the viewer is invited to imagine such as through gestures made by figures, their glances, or implied movements. 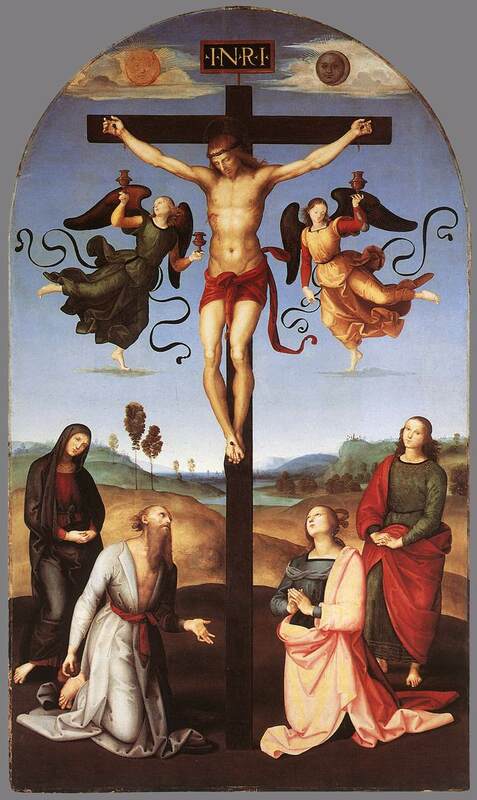 Look at this painting, Raphael's Crucifixion (1502-03): click here (external link; Web Gallery of Art). First of all, identify the dominant lines provided by the edges of objects. Now, identify the lines which are implied by the gazes or gestures of the figures. Why do you think this might matter? Look at Gericault's painting The Raft of the Medusa (1819): click here (external link: the Louvre). The painting depicts survivors from a naval ship which had sunk in 1816, who were left to cling on to a raft for thirteen days, after which only fifteen survived. Garicault imagines the survivors spotting the sail of a distant boat. What are the dominant lines in this painting? This section introduces the notions of open and closed composition through two examples. Look at this painting by Michelangelo: the Doni tondo (c. 1506): click here (external link). What are the dominant lines and force lines here? Is the painting self-contained? In the example of the Raphael Crucifixion, which we discussed earlier in activity (xvi), balance and symmetry were provided by the very clear lines of the cross, which dominated the painting. However, sometimes we find artists disrupting balance and creating asymmetrical structures. The effect of this is usually to create an unstable impression: it is difficult for the eye to settle. It is always worth considering how symmetrical a painting's composition is, and the effect of this. 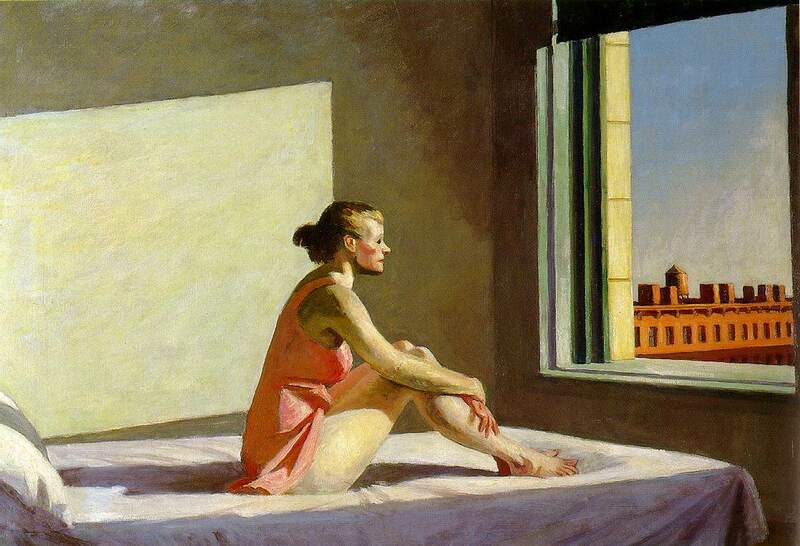 When we look at a painting, our gaze moves across the different elements of the painting. Thus, even though a painting is static, our experience of it is not. Artists can manipulate the way in which our gaze moves across a painting. Our eyes tend to follow lines, and rest on obvious focal points. We tend to follow the gazes and gestures of figures. Our eyes move from foreground to background, and back again. It is worth asking, then, when looking at a painting, how the artist is controlling the way we move across it. This is what is meant by the rhythm of a painting. Look at this work by Wassily Kandinsky, Improvisation 31 (Sea Battle) (1913): click here (external link; National Gallery of Art). Try and identify the ways in which the rhythm is being manipulated. It does not depict anything. But if we think about the way it is composed, and the way this guides our eye around the painting, we can start to experience the effect the work produces. You might also find it helpful to think about the ways in which colour guides the eye across the painting. What are the dominant lines in the painting? What are the force lines evident or suggested in the painting? Is the composition open or closed? What effect does this have? Is the composition symmetrical or asymmetrical? What effects does this have? In what ways is the composition guiding our eye around the painting? Does it create a strong rhythm, or is it more stable?